Each month the Mosaic is published to keep everyone in the village up to date with events, particularly at times of major social activities. Detailed information and news is very welcome as well as any articles on subjects relating to the village. Pauline Sherwood and John Harding took over its editing at the beginning of this year. The Mosaic is funded by the generosity of sponsors, all of whom feature on the back page. We also receive generous donations from the Estate, the Parish Council and the Church. We deliver around 110 copies each month thanks to local volunteers as well as it being available to view or download via the below links……. 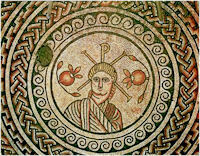 The Mosaic magazine is named after the world famous Roman Mosaic found in Hinton in 1963 and until recently exhibited in the British Museum. Due to shortage of space a new location is being sought. A public meeting was held in Hinton Village Hall in June – see article in June Mosaic. The meeting arranged through the initiative of Rev. David Dunning, was attended by 27 villagers, the Mayor of Sturminster Newton and the Chairman of the Trustees of the Exchange. David Dunning advised the meeting that there were no plans for any part of the Mosaic to be displayed at the British Museum in the foreseeable future and it would remain in their stores until further notice. Dorset County Museum was offered the Mosaic in an attempt to return it to the county but the offer was rejected due to lack of space. David felt that, as villagers had not been consulted about the decision, they should at least be made aware of it and, if possible, to have some input in where the Mosaic should be displayed in the future. A lively discussion ensued between the attendees about the possibilities for its return and barriers that were likely to be put up by the BM. It was agreed that it was impracticable to return the Mosaic to HSM, due to the lack of infrastructure and the impact of large numbers of tourists on the village. There was, however, support for it to be housed somewhere in Sturminster Newton, which would certainly help to regenerate economic prosperity to the town. It was accepted that opening up discussions with the BM and other interested parties was the first step in the process. Chris Hardiman agreed to act as the village representative on the Sturminster Newton Working Party set up to explore the town’s regeneration. There was general agreement amongst the attendees of the great possibilities for the return of the Mosaic to be the catalyst for the regeneration of the whole area of North Dorset, which would include a focus on the literary and historical aspects and its beautiful countryside. The situation is very much ongoing and it has been arranged that early in 2019 British Museum staff will visit and discuss with interested parties some possible sites for its relocation in the town.